Throughout the years I’ve gotten used to people misspelling my name. My late aunt seemed to spell it differently every time she wrote me a Christmas or birthday card, and teachers used to misspell it, too. In the third grade I started to write “Mal” on top of my papers to avoid confusion, but my mom didn’t approve. I love the unusual spelling of my name, but I’m continuously surprised by how many people misspell it. Several editors recently spelled it wrong, prompting my editor to suggest that I write about the experience. To find out more about misspelled names, I got in touch with Regret the Error’s Craig Silverman, who said they’re the sixth most common newspaper error. The error is so common, Silverman said, because journalists forget to ask for the right spelling, they do it from memory, they assume the name is spelled the “normal way,” or they’re misled by incorrect sources online. David Folkenflik & Eric Deggans — Both had their names misspelled by their own publications. 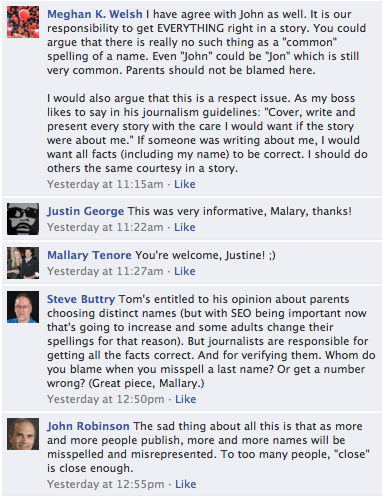 I was surprised when a couple of readers said that my parents are to blame for spelling Mallary “the wrong way.” One reader, for instance, tweeted: “Good story, will use it in my journalism classes. But, I’m sorry, your mother spelled your name wrong, you pay the price.” (He since removed the tweet but made a similar comment on my story.) 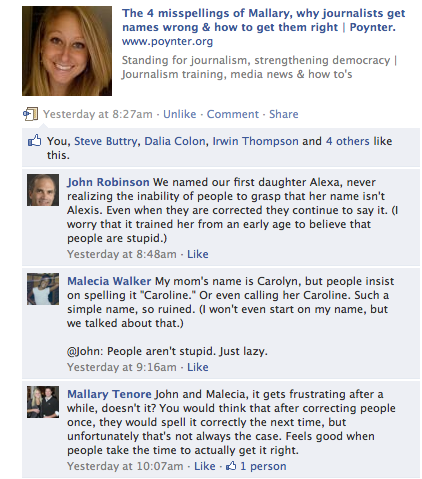 I responded by saying that Mallary with an “A” isn’t wrong; it’s just different from the norm. How has your name been misspelled? Thanks, Gina! 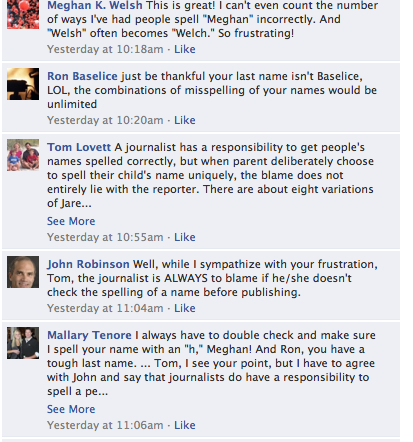 You’re right that spelling someone’s name right shows that you pay attention to detail — and that you care. Oh I can really relate to this. I also have a pretty common name that is spelled weird. I’ve gotten Lynette, Lenette, Linnette, Lunette. 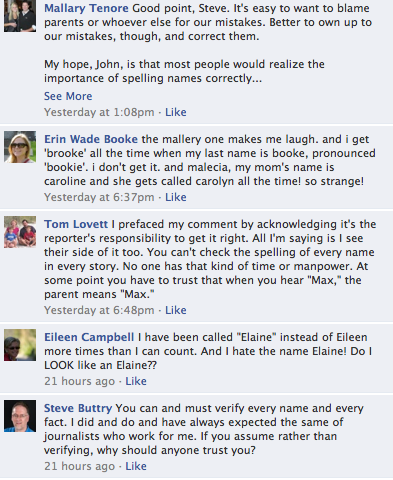 Mostly no one seems to want to accept that my name does not end in -ette. I don’t expect anyone to know how to spell my name from just hearing it, so I don’t get upset when that happens. It’s when I know you’ve SEEN my name and you have access to how it’s spelled that I get upset. I’ve seen people misspell my name in email replies to me. I sign all my emails. Not to mention my email IS my name. No excuse! I love how your name is spelled, I agree with what your mom said! I can see how your name would get misspelled! People misspell my name all the time in emails, so I can feel your frustration. It’s surprising how often this happens, given that I sign all of my emails, too! I’m with you. I have funky spelling first name (which isn’t all that funky in Europe) and a weird last name so get some awesome variations. I’m with Leannet – I get a lot of replies to emails I’ve sent and still spelling my name wrong. It’s right there in front of you! Typically I get ‘I know it’s spelled weird’ so they just make it up or ‘I don’t know how to do the accent’ so they just ignore it. I think it’s definitely a sign of respect and an indication of your professionalism to get names correct. If you have to check quotes and facts, why not names?